These high quality Visco Q-lon Door Kits will help seal drafts from around the top and sides of exterior doors. The kits are made of polyethylene-clad urethane foam secured to a on a galvanized aluminum carrier. To install, attach the carrier to the door frame with screws (included), so that the Q-lon foam gasket butts up against the door when closed. 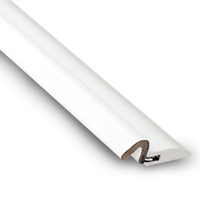 They can be installed on either metal or wood doors, and are available in either a powder-coated white or bronze color. The UV stabilized foam will maintain flexibility down to minus 4 degrees Fahrenheit. One kit includes two 96 inch side pieces and one 72" header piece. With appropriate tools (e.g. hacksaw) a kit may be cut to fit smaller door openings. Finish: white finish. Set: 1-6' piece and 2-8' pieces. Custom lengths also available.